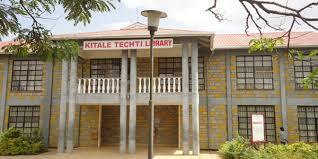 Kitale Technical Training Institute- courses, application forms, fee structure, contact. The following are the courses offered at Kitale Technical Training Institute . Fee structure varies per programme. Contact the admissions office for further details. Application forms can be obtained from the admissions office. Kisiwa technical training institute- courses, application forms, contacts. Mombasa Technical Training Institute- courses, application forms, contacts. Michuki Technical Training Institute- courses, intake, fee structure, application forms, contact. Ramogi Institute of Advanced Technology- courses, application forms, fee structure, contact.